Taiwan boats enter Japan waters Jump to media player Dozens of Taiwanese boats have sailed into Japanese waters, in the latest protest over a group of tiny islands in the East China Sea. 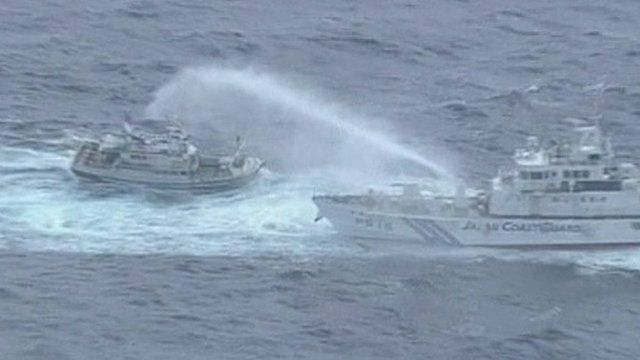 Taiwanese boats protest in Japanese waters Jump to media player Dozens of Taiwanese boats sailed to disputed East China Sea islands in a brief protest, as top Japanese and Chinese diplomats met in Beijing to ease tensions. Dozens of Taiwanese boats have sailed into Japanese waters, in the latest protest over a group of tiny islands in the East China Sea. The islands, called Senkaku in Japan and Diaoyu in China, are controlled by Japan but claimed by China and Taiwan. Meanwhile, top Japanese and Chinese diplomats having been holding talks in Beijing aimed at easing the tensions. The BBC's Beijing Correspondent Martin Patience reports.